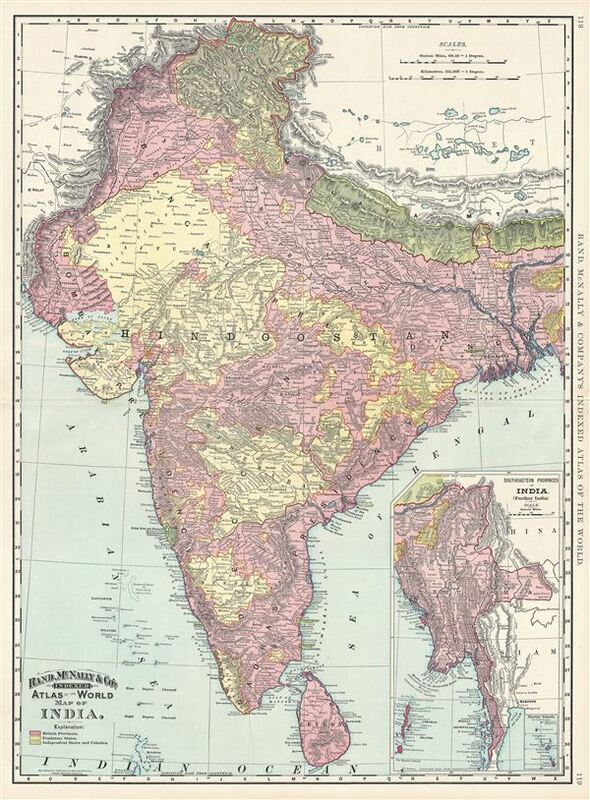 This is a beautiful example of Rand McNally and Company's 1892 map of India. It covers the entire subcontinent from Kashmir south to Ceylon (Sri Lanka) and from Sindh east to Assam. An inset in the lower right quadrant details the Southeastern Provinces of India (further India). Color coded according to British provinces, feudatory states, and Independent states and colonies, the map depicts most of what is today modern India and what was, when this map was made, British India. Following the Sepoy Revolt of 1857, the east India Company was dissolved and governance of India was administered directly by the British Crown. The British Raj ruled India until its independence in 1947. In 1885 the foundation of the Indian National Congress led the struggle for independence. The party still holds dominance in Indian politics and is the largest and one of the oldest democratic parties in the world. Rand McNally identifies numerous cities and towns, as well as noting rivers and various other topographical details. Relief shown by hachure. This map was issued as plate nos. 118 and 119 in the 1895 issue of Rand McNally and Company's Indexed Atlas of the World - possibly the finest atlas Rand McNally ever issued. Very good. Original centerfold. Text on verso. Rumsey 3565.032 (1897 edition). Philip (atlases) 1026 (1898 edition).